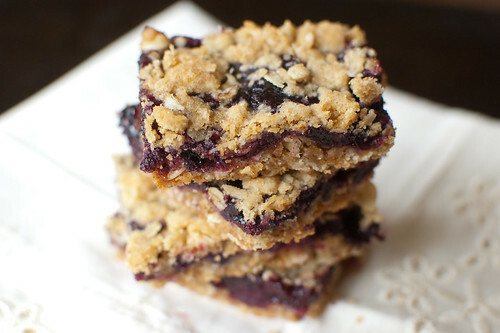 This is a great way to use up some of the blueberries in my fridge right now! I love a crumble - yum! These sound perfect! Beautiful recipe. Looks great, they do sound like they would be delicious with other fruits too! Crumb bars are one of my favorite treats. These look delicious. Haha! We just had the same experience... it was very hot and all the blueberries had been picked over. We'll give it a try next year. These look delicious! Blueberries are my little guy's favorite too! And he loves Nutrigrain bars...I will have to give these a try! These bars look really good. In the blueberry mix you said to add sugar to the blueberries and to the cornstarch but there was only one amount of sugar 1/2cup. What is the correct amount for the thickner? Thanks for catching that. I corrected the recipe to say "combine the blueberries and lemon juice." The sugar is added with the cornstarch later. Hope that makes sense! These look great! I love that they taste like Nutrigrain bars - those are my favorite! I made something similar this summer with dried cherries. Totally irresistible with that sweet fruity filling and that buttery crumble top. Can't wait to try it with blueberries now. Just found your blog and I picked your blueberry crumble recipe and intend to cook soon. Sure it will be delicious. Thank you Josie. These look just like the ones at Starbucks which are so delicious - can't wait to try these out! I can’t wait to try this recipe! Sounds wonderful!! Yum! I have a pan of these sitting on my dorm desk right now...heaven! I needed a use for the blueberries I picked this weekend and these were perfect. Just made these last week, they were DECLICIOUS! The only issue I had was that the bottom layer never really hardened and they were a bit delicate while eating. Any suggestions for this? to say that I've truly enjoyed browsing your blog posts. After all I'll be subscribing to your feed and I hope you write again very soon!